The Mapex Saturn V Club Fusion kit is a versatile 4 piece drum shell set perfect for a wide range of genres and playing styles. The hybrid Maple/Walnut shells deliver a rich resonant tone with excellent volume and sustain while the innovative SONIClear™ bearing edge and mounts work to increase vibrations in the shell and heads maximising the drums resonance and projection. 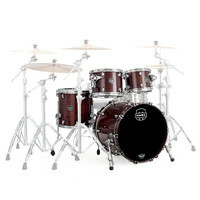 This entry was posted in Mapex and tagged Drums-and-Percussion. Bookmark the permalink.